This itinerary is all about stunning scenery and charming villages. Based in the beautiful Forest of Dean, we will enjoy the spectacular views all around this scenic area. - Visit to Tintern Abbey. - Entry to Chepstow Castle & Museum. - Return journey on the Dean Forest Railway. - Guided tour & tasting at Hillside Brewery. - Live entertainment in the hotel. With an extended comfort stop on the journey, we travel to our hotel in Gloucestershire. This morning we enjoy a scenic drive along the beautiful Wye Valley. We make our way to the historic market town of Ross-on-Wye, continuing south towards Monmouth before we arrive in the village of Tintern, dominated by the spectacular remains of Tintern Abbey. We spend time at leisure here visiting the craft and antique shops. Today we make our way to Chepstow, beginning with a visit to Chepstow Castle which offers breathtaking views across the Wye Valley, before we pay a visit to the award winning Chepstow Museum. After some time exploring the town we travel to Norchard, the main station of the Dean Forest Railway. 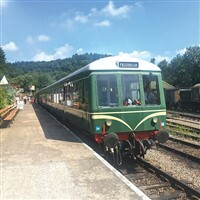 We have time to visit the museum and be shown around the locomotive restoration shed before we take a return journey on a steam or heritage diesel train through 8.5 miles of the medieval Forest of Dean. Today, we discover the magnificent Brecon Beacons. We see Pen y Fan, the highest peak in South Wales, and the traditional Mid-Wales town of Brecon before stopping for lunch in the pretty town of Hay-on-Wye, which holds its market every Thursday. We pay a visit to Hillside Brewery, a microbrewery in the Forest of Dean where we can enjoy a tasty ale overlooking some of Gloucestershire's most stunning landscape. On our final day we enjoy a leisurely breakfast before making our journey home. Located on the outskirts of Coleford, the hotel is positioned in a peaceful location on a hill with beautiful views over the Wye valley. Each room is traditional in style and equipped with TV, hairdryer and tea/coffee making facilities. The hotel has no lift, but there are ground floor rooms on request. The restaurant and bar are located in the Clubhouse which is in a separate building opposite the bedroom building. The hotel boasts a county standard bowling green as well as an 18 hole golf course (both payable locally) set in the beauty of the Forest of Dean countryside.